From the masterminds behind The Play That Goes Wrong, Peter Pan Goes Wrong and The Comedy About A Bank Robbery, comes another “ridiculously funny” London show: Mischief Movie Night! 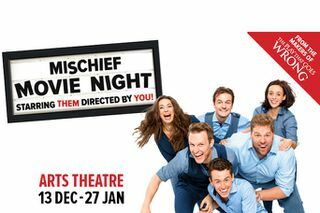 Exploding onto the West End stage this December, Mischief Movie Night from the award-winning Mischief Theatre is an improvised show directed by you and produced live on stage with music, directors' cuts and deleted scenes. No fear, in the hands of this Olivier Award-winning comedy theatre company, this improvised production is guaranteed to have you rolling in the aisles. Don’t delay, Mischief Movie Night is “more a party than a show” – tickets are expected to sell like hotcakes. The cast includes Josh Elliot as Not Sure, Dave Hearn as Uncertain, Harry Kershaw as No Idea, Henry Lewis as Don't Know Yet, Ellie Morris as Couldn't Tell You, Charlie Russell as TBC, Jonathan Sayer as Who Knows and Henry Shields as Guess Who. They will be accompanied by musicians Chris Ash and Richard Baker. Write your own. This experience is about the audience. The choices you make dictate your evening, every event is brilliantly unique and however many times you see Mischief Movie Night, no one show will be the same! You pick a genre, location and title and the company improvises the show, complete with rewinds, fast forwards, directors cuts and a live score. Mischief Movie Night is not available to book, please sign up to our newsletter for updates and offers on forthcoming and available shows. Where is Mischief Movie Night?